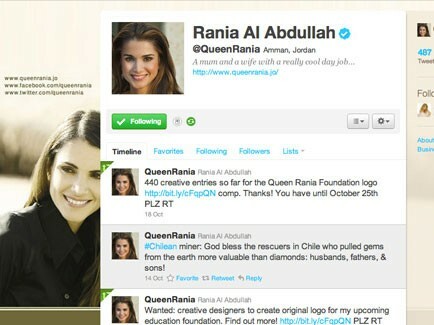 (Office of Her Majesty, Press Department- Amman) – Her Majesty Queen Rania came in third, following Barak Obama and 10 Downing Street in the list of most influential world leaders on the social network Twitter. The list was compiled as part of a report by the Digital Policy Council, according to which, 1 out of 5 heads of state are currently on Twitter and engaging in social networking on the internet. The list also included leaders such as The UAE Vice President, Prime Minister and Ruler of Dubai His Highness Sheikh Mohammed bin Rashid Al Maktoum, President Hugo Chavez of Venezuela, President Abdullah Gul of Turkey and Japanese Prime Minister Yukio Hatoyama.